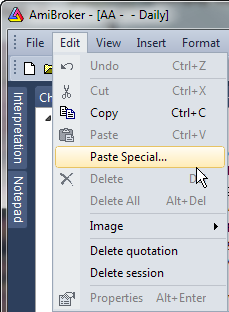 Now, in order to customize the toolbar go to Tools-> Customize menu. 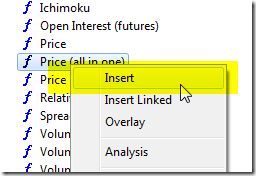 That switches AmiBroker into special customization mode. Now, while keeping the customize dialog open, we can just go to View->Intraday menu and pick the items we need, then start dragging it with the mouse cursor to the toolbar of our choice. If we keep holding down CTRL key while dragging the items, a copy will be created on the toolbar, so the items will not be removed from the original menu. There is an easy way to avoid switching the price chart style back and forth if we want e.g. 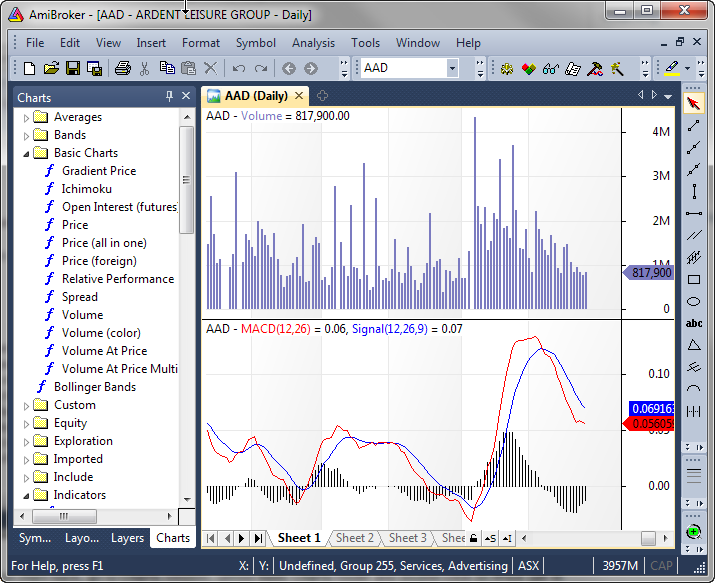 to display a candlestick chart for our stock symbols, but a line chart for just a subset of tickers in our database (e.g. mutual funds). To achieve that – we need to set Continuous Quotations option to No in Symbol->Information window for the symbols that have only one price fixing per day (only close price available). Then – if we choose View->Price Chart Style to Auto – the chart will automatically use Line style for all symbols that have Continuous quotations option set to No. Other symbols will still use Candlesticks chart style. A list-view is a view that displays a list of scrollable items in a table-like format. List-views are used in Real-Time quote window, Analysis window, Symbol list, etc. 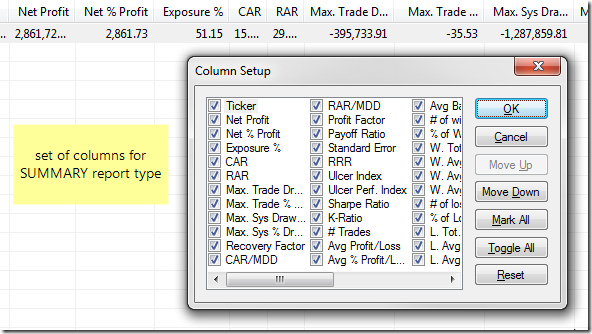 The columns in any list-view in AmiBroker can be customized in various ways to better match our needs and display the required statistics and readings the way we find it most useful. 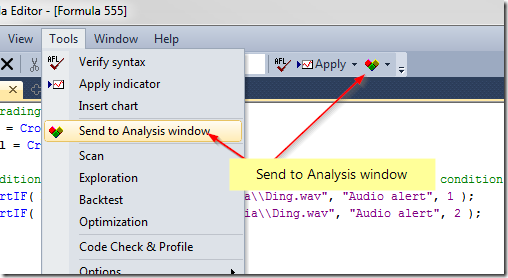 For the sake of example let us consider Analysis window result list. and their width can be re-sized by dragging the divider lines between columns (double-clicking on that area will auto-resize the columns to match their contents). Hint: You can auto-resize all columns to their content at once by holding down Ctrl key and pressing + (plus sign) key on the numeric keypad. 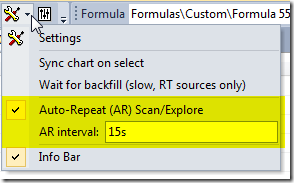 For more operations it is possible to use Setup Columns… menu available from the context menu, which displays after right-clicking on the headers. 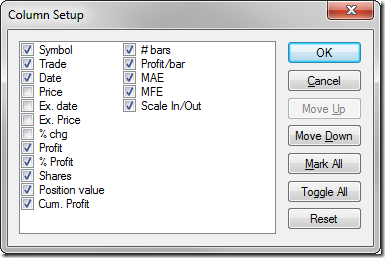 Setup Columns dialog allows to re-order, hide/show selected columns. 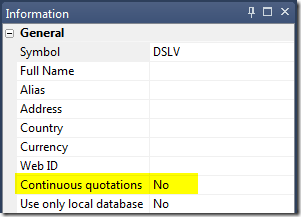 To hide a column uncheck the box, to show it back again, check the box. 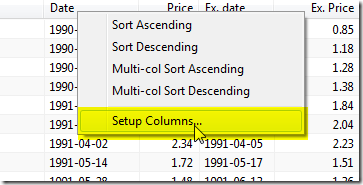 To re-arrange columns, select a column and click Move Up/Move Down buttons. 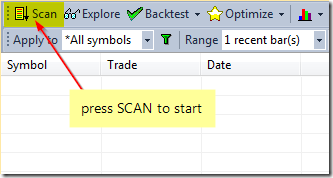 It is important to remember that the set of columns will depend on the last run mode, so it will be different for Scan, for the Backtest Trade List, for Summary type of report or Optimization. 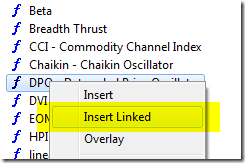 In order to explain possible relationships between chart panes in AmiBroker, let us first introduce two important attributes associated with each chart pane, these are Chart ID and File path. The File path defines physical AFL file on your hard-drive that contains the indicator code used to generate charts. 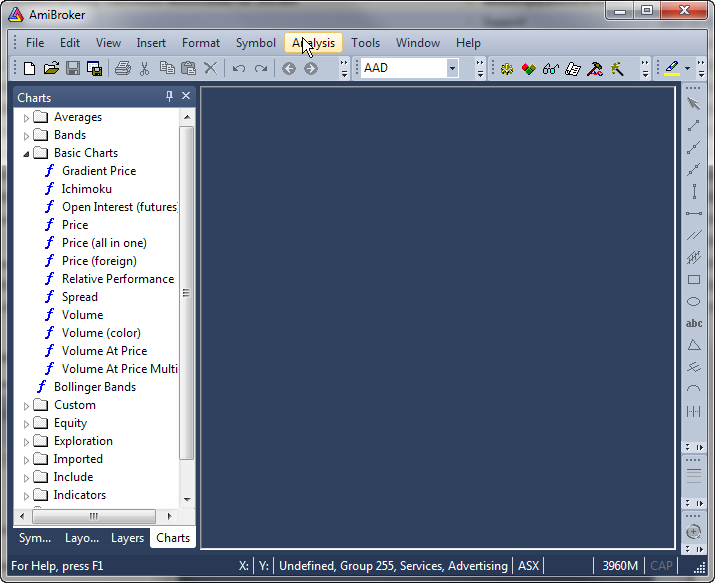 The Chart ID is an index to AmiBroker’s internal chart table. 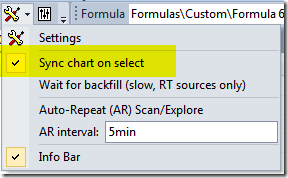 The chart table holds chart settings such as those seen in Axes&Grid tab, including the File path. So knowing the Chart ID, AmiBroker knows everything about the chart. The Chart ID uniquely identifies the chart. 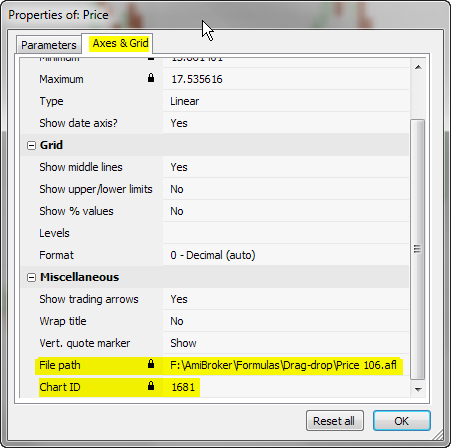 Chart parameters are keyed by Chart ID so two different charts may have same names of parameters, yet parameters are independent if those charts have different ChartID. 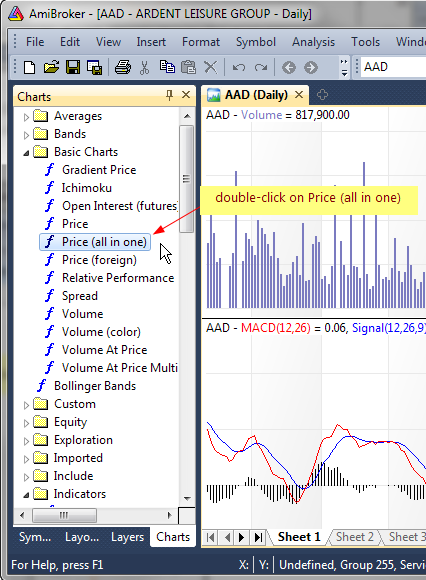 Chart IDs are stored in the layout files so AmiBroker knows which charts should be loaded when layout is loaded. if Chart IDs are different in both chart panes but File Path is the same, then these are different charts, yet they share same formula file. In such case hand-drawn studies will not get transferred and parameters will not be shared, but drag&drop operations and changes in the formula will affect both charts. 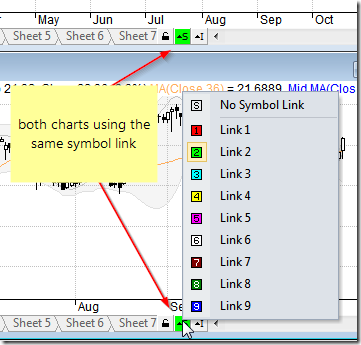 This situation will occur if we use Insert Linked option from the Charts window to create a new chart pane directly linked to the original formula. if Chart ID is the same for both – then it is essentially the very same chart. It means that all the hand-drawn studies and parameters are common for both charts (changes in one chart pane will affect the other) and all the drag&drop operations or formula changes affect both charts – that is because as a result of dragging and dropping indicators the underlying code is being modified (new sections are added). Such relationship between chart panes will happen when we open another chart window that uses the same chart template as the previous window (e.g. 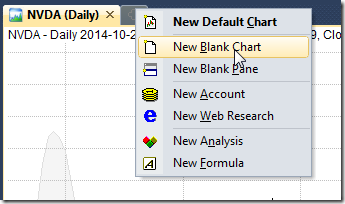 using File->New->Default Chart) or save chart template and load it from the other window. 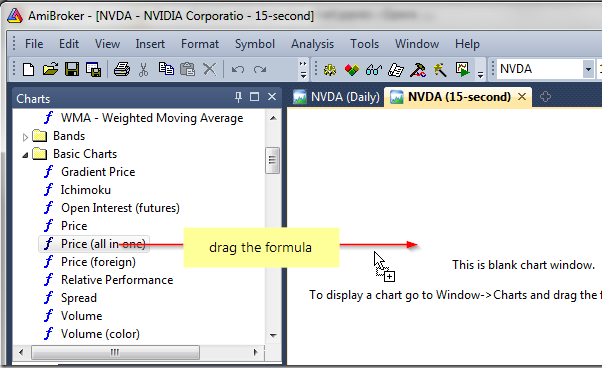 Choosing first option creates new Chart ID, and creates a copy of formula, so resulted chart is independent from source chart. 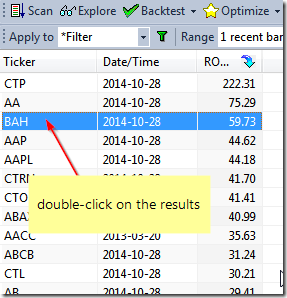 Choosing second option creates new Chart ID, but links it to same formula as original, so the formula is shared. 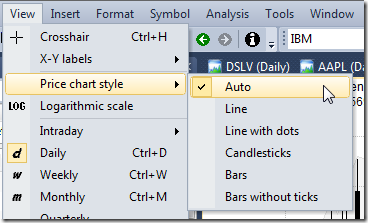 Choosing third option inserts a pane that uses same Chart ID (identical chart, everything shared).